Holy cow. We’re having a baby. As I sit here closing in on 17 weeks, I still can’t believe I’m typing those little words: we’re. having. a. baby. Patrick and I started dating when we were 18 year old, babies ourselves, and still we talked about kiddos for about as far back as I can remember. Those of you who know us well can likely even recall a conversation with P where he spoke of the “soccer team” he hoped to have one day. After getting married in 2014, we took our time. We traveled. We built careers. We built a home. We traveled some more. I always assumed we’d settle into building our own little league crew quickly, but as time went on, we found ourselves calling time outs, feeling we weren’t quite there yet. And off we went. Whether it was the Catholic guilt, that scene in Mean Girls or the stellar sexual education I received in middle school, I had it in my head that once you stop preventing pregnancy, there it is. Wham. Baby. So when weeks turned into months, turned into a year, it took its toll. For those of you who were along that journey of crazy with me, God bless you. I’m not sure what I would have done without your calls to ask how it was going, to be a shoulder when I needed to cry on or to be the ear that listened when I just felt like screaming at the world. You’ll never know what those conversations meant to me. “What if” followed behind me like a lurking puppy and it if weren’t for your questioning when I’d fall quiet, your prayers and your encouragement, I would have punched that puppy in the face. This thing I’d be told would happen if I as much looked at a boy just would. not. happen. This past fall, we started the journey of testing to get some answers. 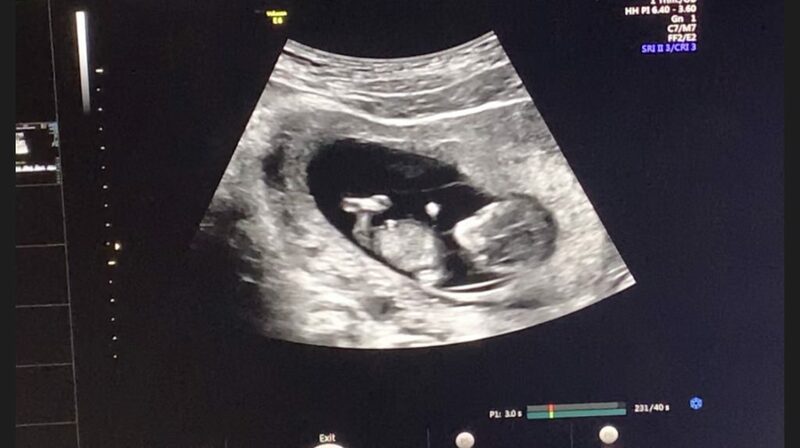 By early October, after a flurry of testing appointments, I had my first ultrasound appointment that started with the tech asking if we were “coding this as infertility” and ending with a cheerful sendoff of “I hope to see you here for another reason next time!” Gulp. Here we go. Following that visit, when my doctor didn’t have too many clear answers for me (things looked a little off, but not so off to warrant medication), we talked about what was next (P getting tested), what would be next after that (a potential surgery in the new year) and we would go from there. 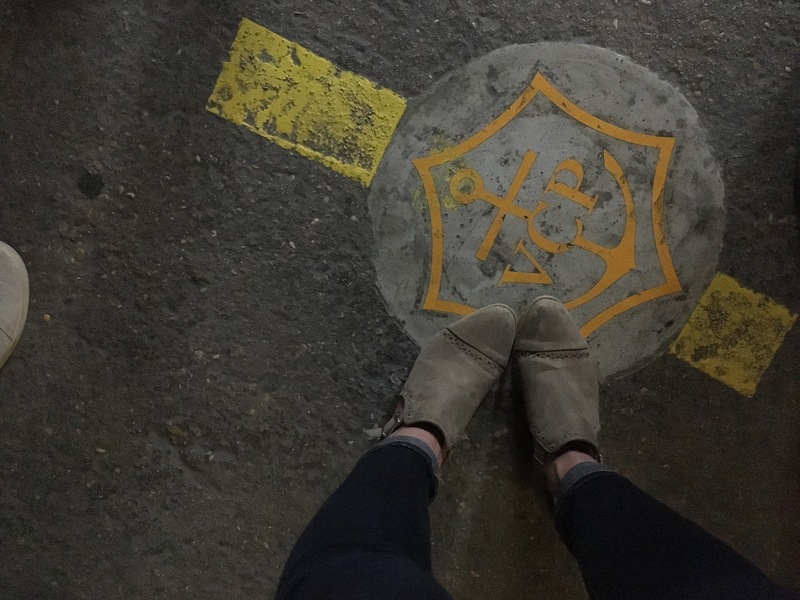 While it was overwhelming, felt ready to brace for the impact of what could be a longer road that I could have ever imagined sharing with my 18-year-old self. Then low and behold, two days after Thanksgiving and five days after a missed period and in the midst of terrible cramps, I took a test. A test that I hadn’t even purchased for myself. I hadn’t needed to. A test that had been sitting in my medicine cabinet for nearly a year (expired? who knows?) and after a few minutes, that one little word emblazoned on it: pregnant. Boy does God’s timing just get us sometimes. Just a few short weeks later, we were back in the doctor’s office and this time I think my doctor was the one ready to cry — happy tears. We were expecting. Here are a few examples of what we would have missed if it happened just months, even weeks, sooner than it did. We couldn’t have had a care-free trip filled with pisco, penguins and endless hikes to South America with my brother. I wouldn’t have lead the launch of quite possibly the biggest project of my career at Chick-fil-A. 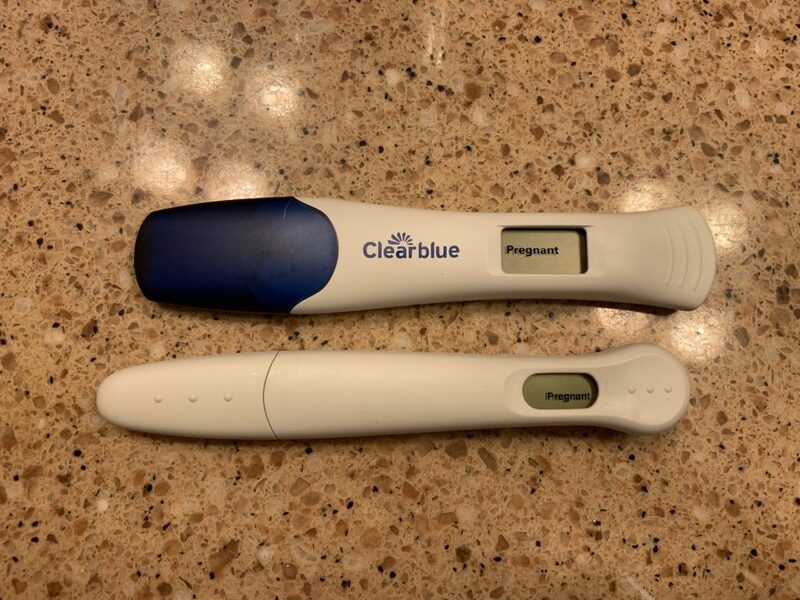 I woke Patrick up to tell him, he asked to go back to bed and I headed out the door to yoga, thinking, “gosh, there is no way.” After picking up new, not questionably expired, pregnancy tests at Target, we confirmed it was indeed a thing. The weeks that followed were the most anxiety inducing of my life. I clung to every Google search for what could been happening in my body convinced this could not finally be true after so many years of dreaming. We had the chance to tell both sets of parents, together, on Christmas eve and they were over the moon. Our requests to keep the news a secret from our large families lasted approximately eight minutes. We would tell our friends and our coworkers in the weeks to come, each hug a little sweeter than the last. So that brings us to today. Today we’re nearly 17 weeks along with this little one who I’ve affectionately named nugget, mostly as I ask he or she to behave as I’m dying to run up Mount Kilimanjaro that until a few months ago was only the neighborhood hill on Skyland. Today, I’m still nearly as nervous as I was 18 months ago but even more thrilled than I could have ever imagined 12 years ago. Patrick and I can’t wait to add a little adventurer to our crew in late July – girl or boy, we don’t intend to find out until he or she makes an arrival onto this earth. We pray that things continue to go smoothly, but if they don’t, we pray for understanding and trust that God has us exactly where we are meant to be, no matter what life might throw our way. To our littlest nugget, my prayer for you is that you come into this world ready to tackle the next adventure by our sides. I pray that you’ll be ready to be the leader of the pack, God willing, because we think the world is waiting on you. I pray that you’ll always keep an open mind and a curious heart towards those around you. And finally, I pray that you know that you are so, so loved beyond measure. To anyone reading this in a season of waiting, a season of miscarriage, or a season of what feels like endless non-answers, gosh, I. Am. With. You. 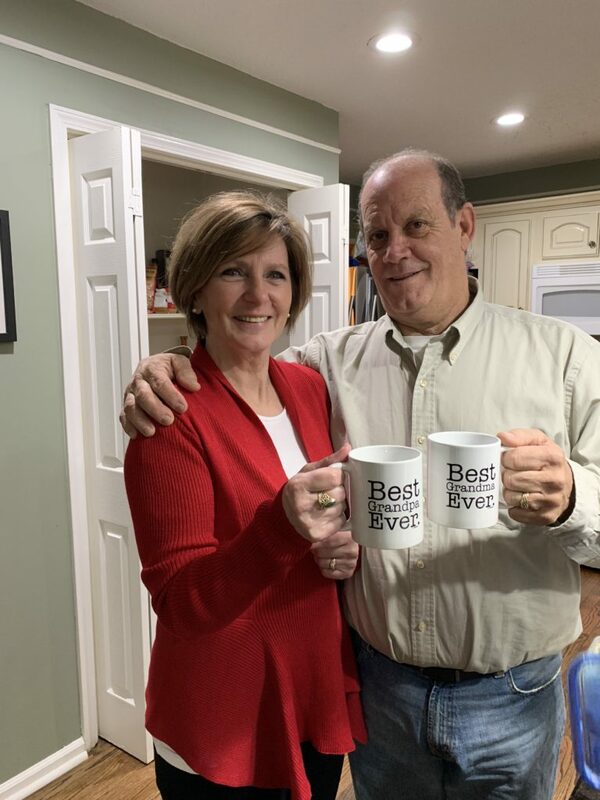 We are thankful that our story has continued with easier answers than expected, but I understand that is not the case for everyone and gosh, I can’t even begin to fathom what you’ve each experienced. I can’t begin to imagine how every story is different and I wish I could lift each and every one of you up in hugs, share with you a glass of wine and even respond to that feeling of I just want to punch my ovaries in the face. If someone can ever do any of the above for you, let it be me, I’m your girl. 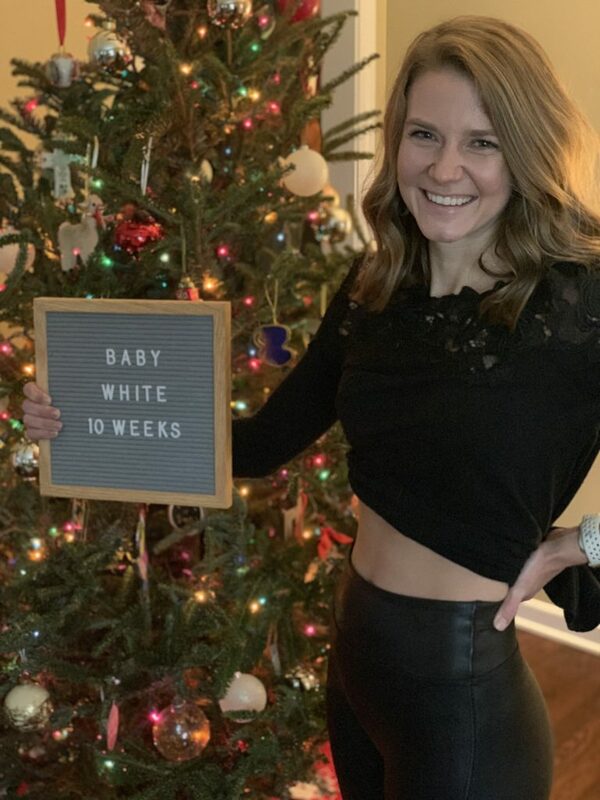 This entry was posted in Let's Be Adults on February 12, 2019 by Kaitlyn White. Some people love margaritas, others a nice glass of pinot, myself, it’s always been a glass of champagne. I even keep the mini-bottles in the fridge at all times. So naturally, the first question I asked after hitting “purchase” on airlines tickets to France was “so we can plan a trip to the champagne houses, right?” Thankfully, my non-champagne fan of a husband responded with an immediate “of course.” We quickly looped our cousins, Will and Ashley who are stationed in Germany, in and began planning a weekend in champagne country, to coincide with Easter. While the champagne region in France is quite large, La Route Du Champagne is nestled between the towns of Reims and Épernay, to the northeast of Paris. Since we would be coming from Paris, we booked a trip on the TGV train from Paris East to Reims. The ticket was roughly €15 each way, per person and is an easy 45 minute ride. The TGV app was a breeze for both booking our tickets as well as presenting them onboard the train. 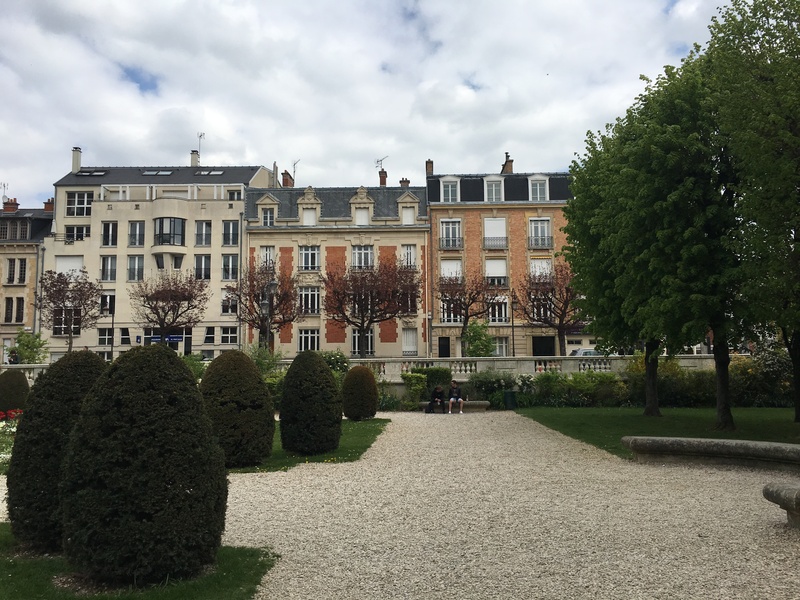 After arriving in Reims, we took a short walk over to our hotel, Hotel Mecure. It was inexpensive, comfortable and central enough to be able to walk about town. They also had a parking garage, as Will and Ashley drove in from Germany to meet us. 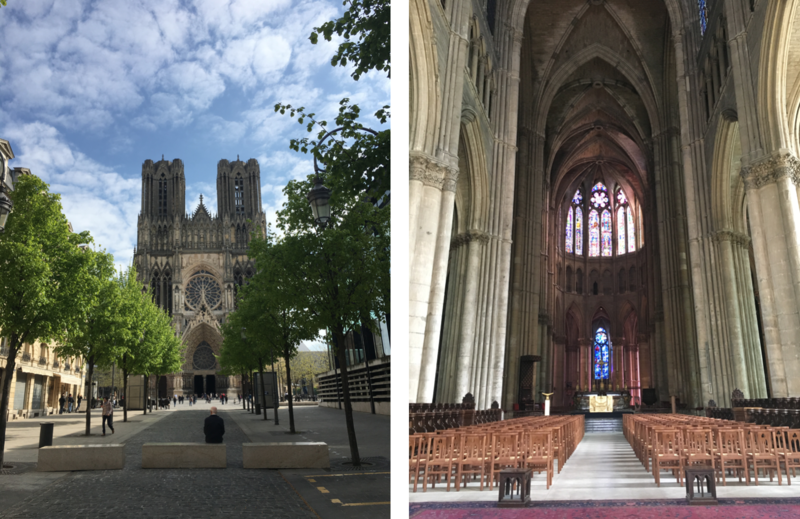 I’d read it’s easy to do Reims/Épernay as a day trip and while that’s certainly true, if you’re planning to see any of the town or multiple houses, I’d certainly recommend doing at least a one night stay. We wanted to be able to see a mix of big houses as well as some of the smaller ones. On our first day, we walked along the water to Veuve Clicquot, our “big house” stop on the trip. Ashley was able to get us in for a tour a day or so in advance. 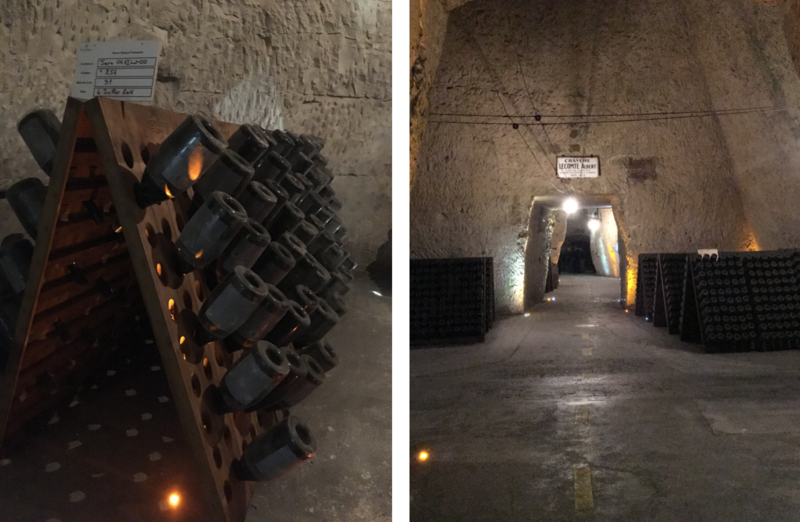 For €50, we received a full tour of the caves as well as two “tasting glasses” of champagne. I was thrilled to see on all of our outings that unlike wine tastings champagne “tasting” means a full glass that must be completed before you move on to the next. 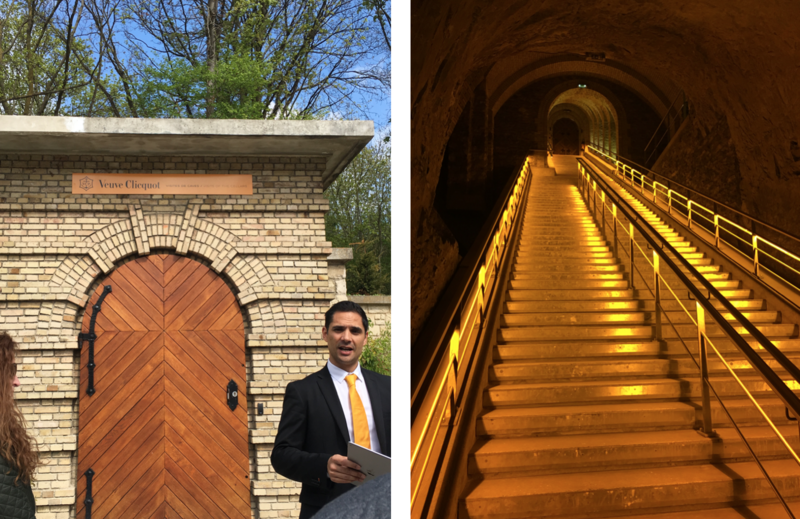 Through the cave tour, we experienced the process of making champagne, as well as heard the story of Madame Clicquot Ponsardin. “Veuve” translates to “widow” in French. 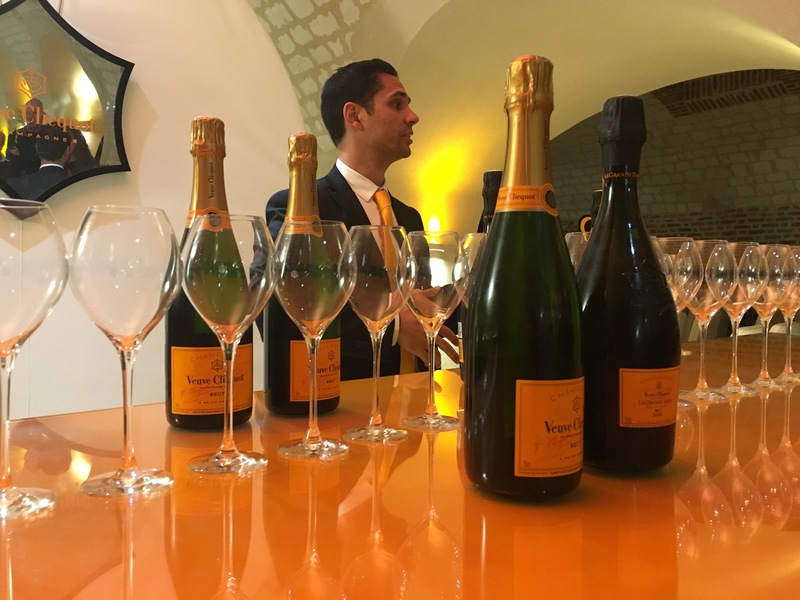 To imagine a widow, taking over her late husband’s family business, at the age of 27, in the year 1805 is nearly unfathomable, and to experience the brand Veuve Clucquot has blossomed into today is just remarkable. Nineteenth century girl power, let me tell ya. You go girl. 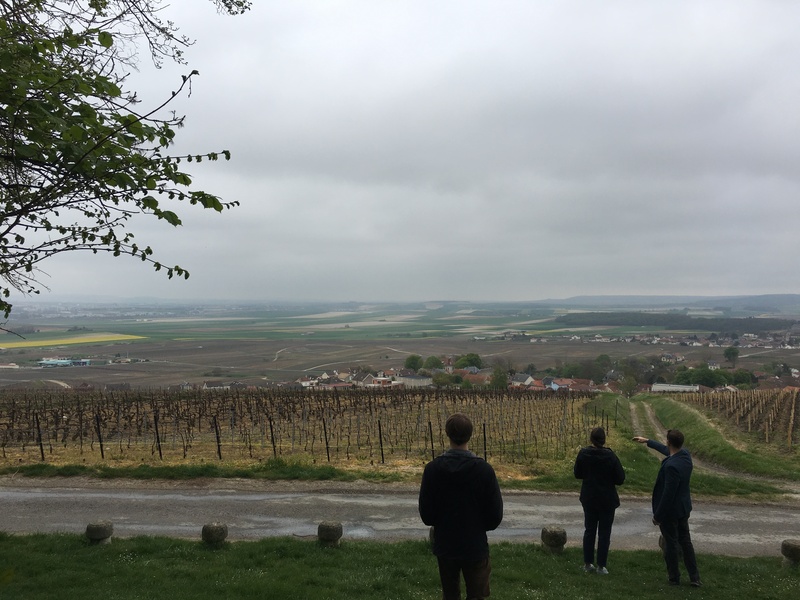 The next day, we opted to explore by car, taking in the full Route du Champagne between Reims and Épernay. The drive is about an hour from end to end, but we made a full day out of stopping between the tiny, countryside towns. Before heading out, we checked with the local tourism office. They offer day tours of the region, which include a stop at one of the houses for a tasting. Luckily, the woman in the tour office pointed out a few of her favorite houses, as well as the one the group would be visiting that day. As it turned out, this was really the only way to get into a smaller house without previous arrangements. After a few calls, the family at René Fresne invited us to join the tour group later in the day, free of charge. We had the pleasure of joining the tour with Hervé, the head of the family’s house. 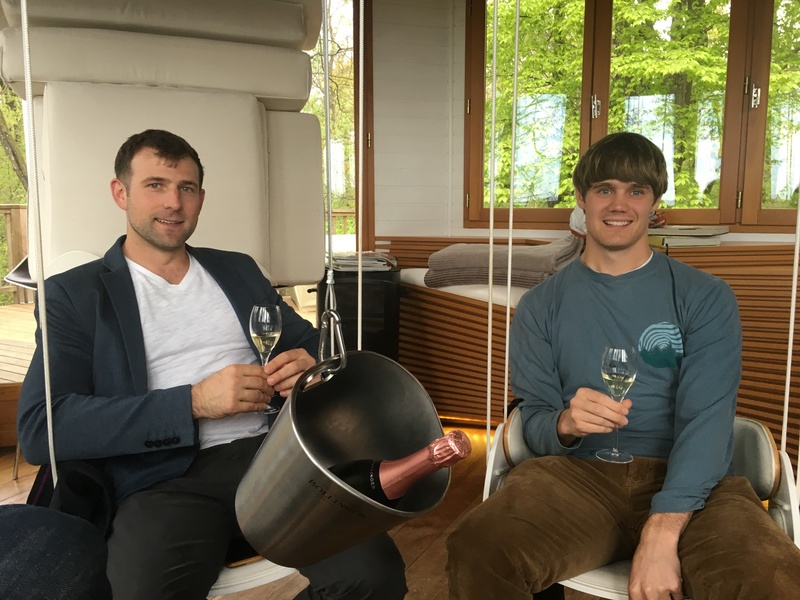 After tasting three very full and very tasty glasses of champagne with no bus on which to depart, we were able to stick around and spend time with Hervé who told us more about his family’s history, his business and his life in France. It was the most special little treat. 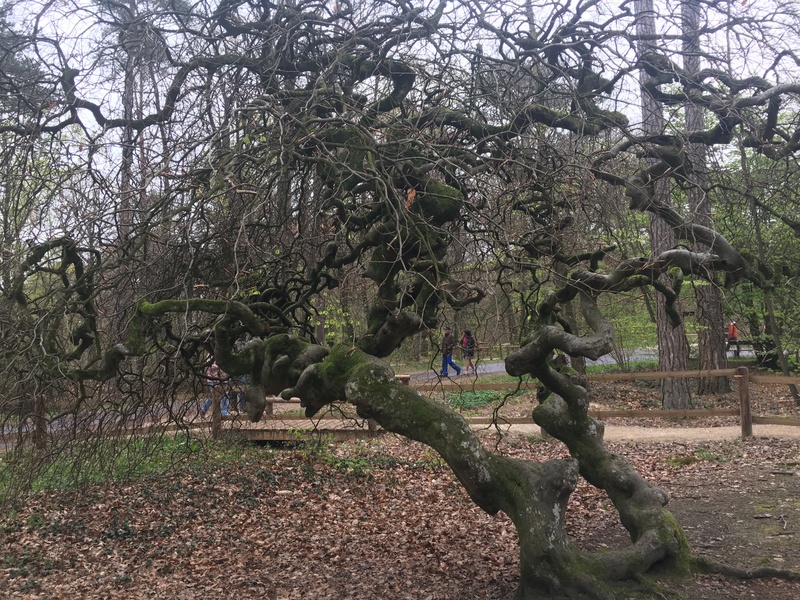 After leaving René Fresne, we made our way towards Verzy, where I had talked a big game about some crazy trees I read about in the Atlas Obsucra. 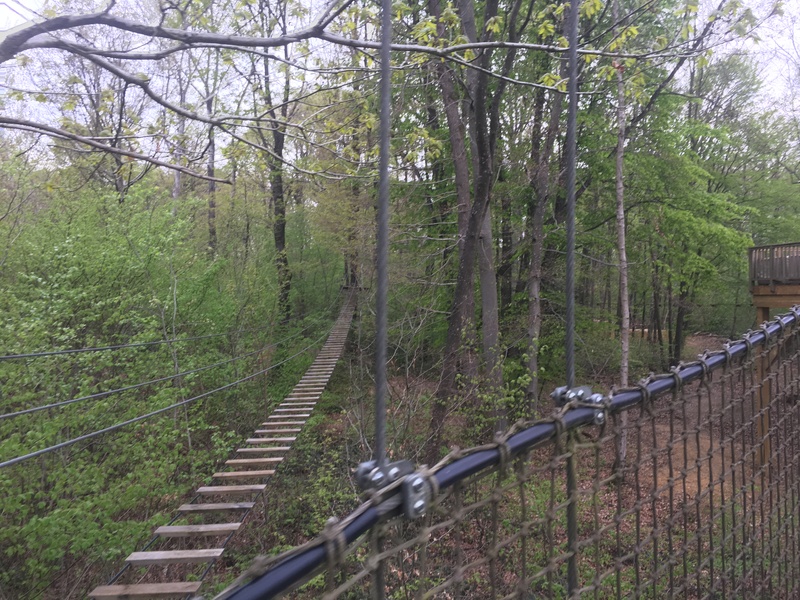 It was a fun little hike, but I expected a bit more out of these guys. We continued on to the Perching Bar, also in Verzy. 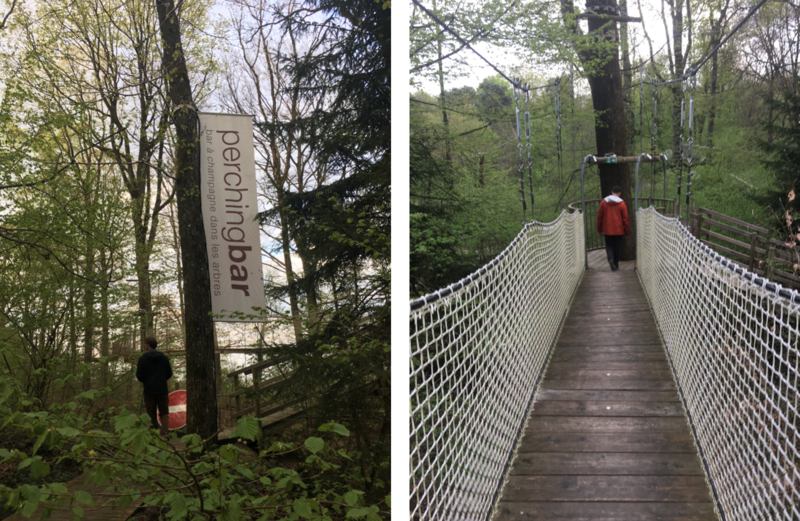 The Perching Bar is a champagne bar nestled in the woods and up a few rope bridges. Admission was around €15 each, but again, this included a glass of champagne. The views up top were incredible and the bar had heat plus really fun swings. 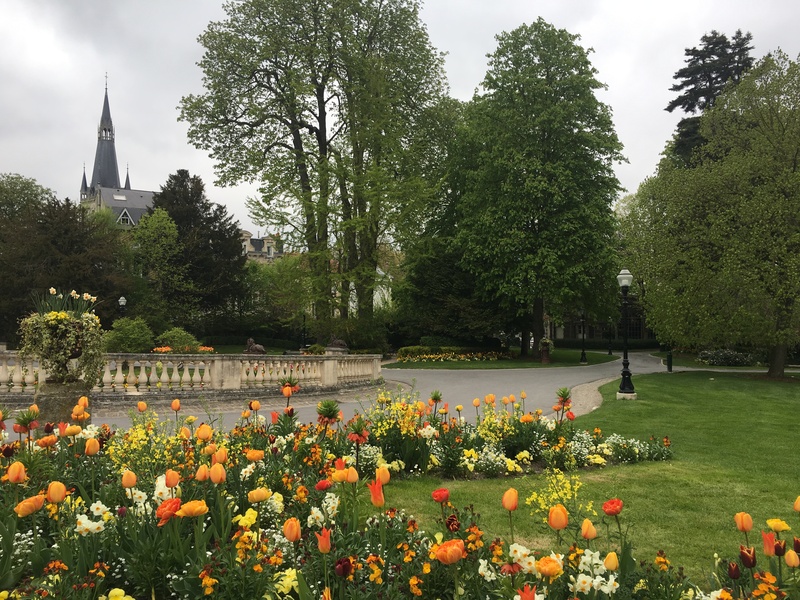 We ended the evening with dinner and a walk around the town of Épernay. 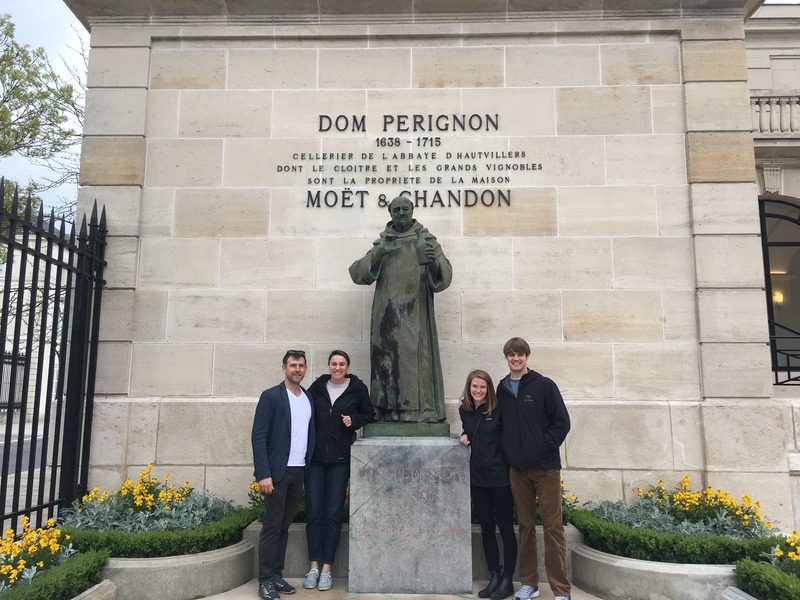 This is the home of some of the bigger houses you’ve likely heard of, a la Moët & Chandon and Dom Perignon. Most required reservations well in advance and were a bit pricer. Back in Reims, we ended the weekend with Easter mass at La Notre-Dame de Reims. The cathedral began construction in 1211 and until the mid-1800s served as the site to crown France’s kings. While beautiful, cathedrals built in 1211 don’t come with heat, so it was quite a chilly little morning. While we didn’t understand a word, thank goodness for Catholic tradition. We at least knew exactly where to be and what to do. It was a great way to celebrate my favorite season of the liturgical year. Something tells me Jesus would have been more than OK with an Easter weekend spend surrounded by family, celebrating each other with bubbly at every turn. 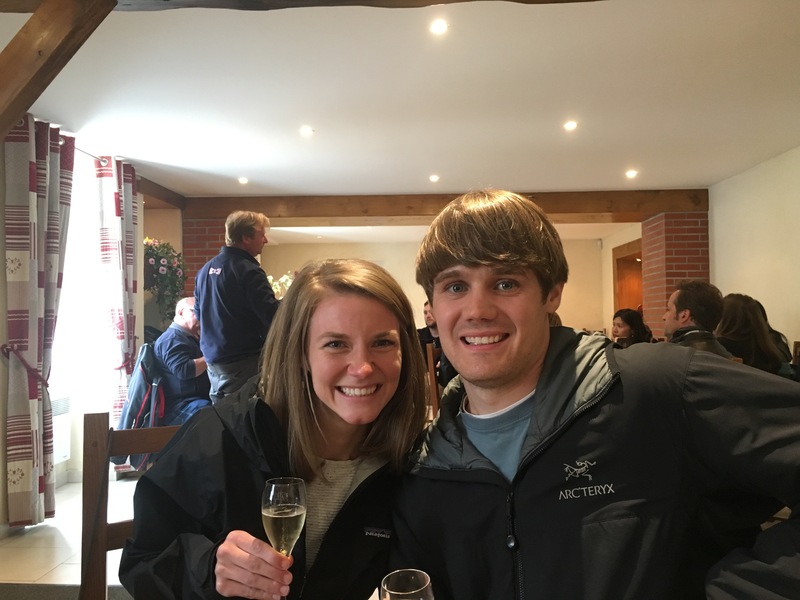 This entry was posted in Everyday Adventures and tagged adventure, champagne, france, vacation on May 14, 2017 by Kaitlyn White. 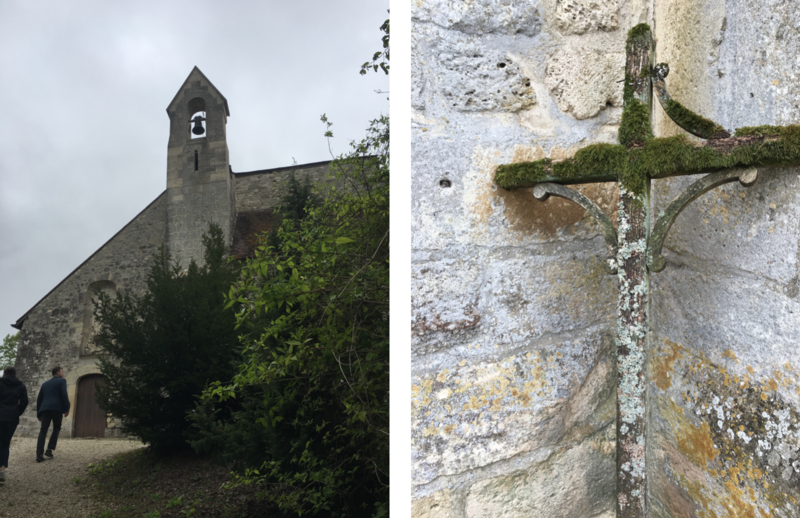 I’m back to blogging for good reason reason – to document our most recent trip to the land of croissants, champagne and words that I cannot pronounce: France. In early 2015, I was rerouted home from a business trip to Barcelona via the Charles de Gaulle Airport. As we flew into Paris, I couldn’t stop gawking over the spacious countryside dotted with stone houses. I didn’t make it outside of the airport on that trip, but dreamed of getting out and onto those tiny, winding roads. Flash forward to November of 2016 when an American Airlines fare sale sent flight prices to Europe into the triple digits. Read: under $400 round trip. 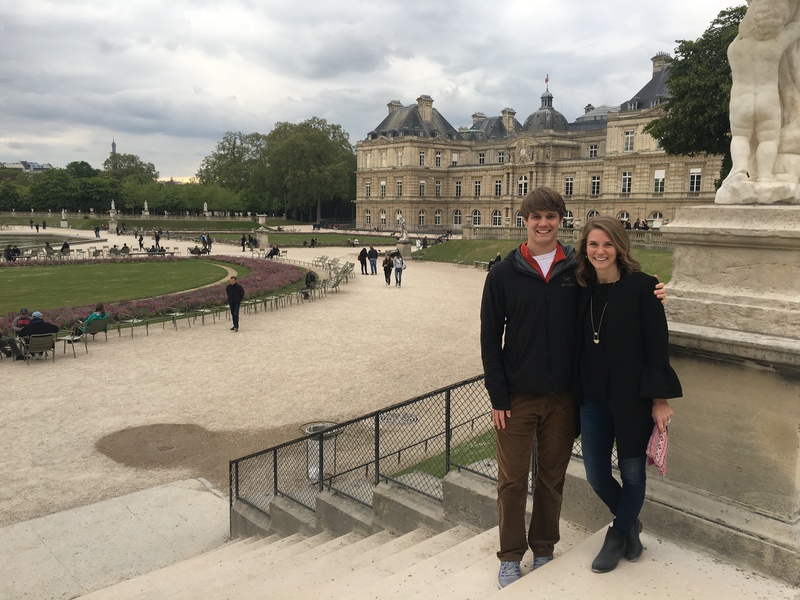 Late that evening, P pulled up Google maps, I pulled up Google flights and we pulled the trigger on turning an expensive Euro dream into an affordable reality. 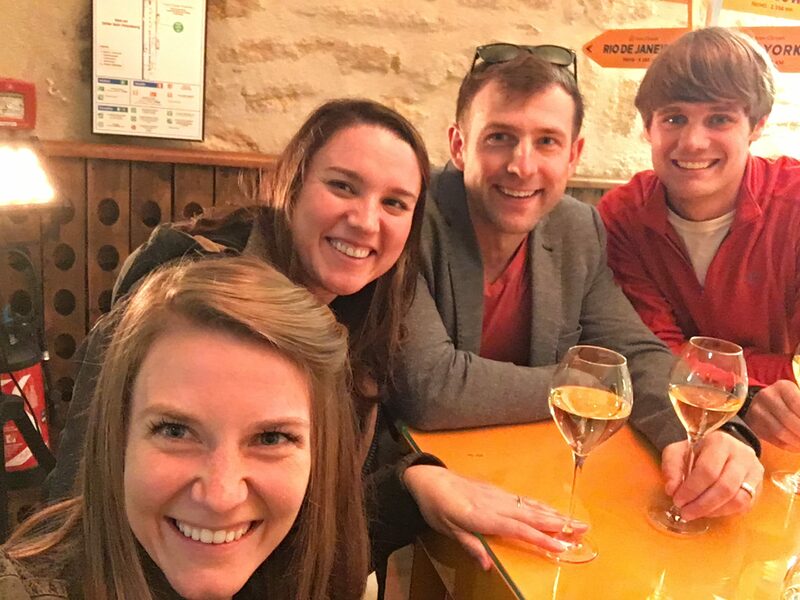 As this flight price fluke starts to look more like a trend here to stay, a few friends and family members have reached out for our French do’s and don’ts. First on the list: do go to France. 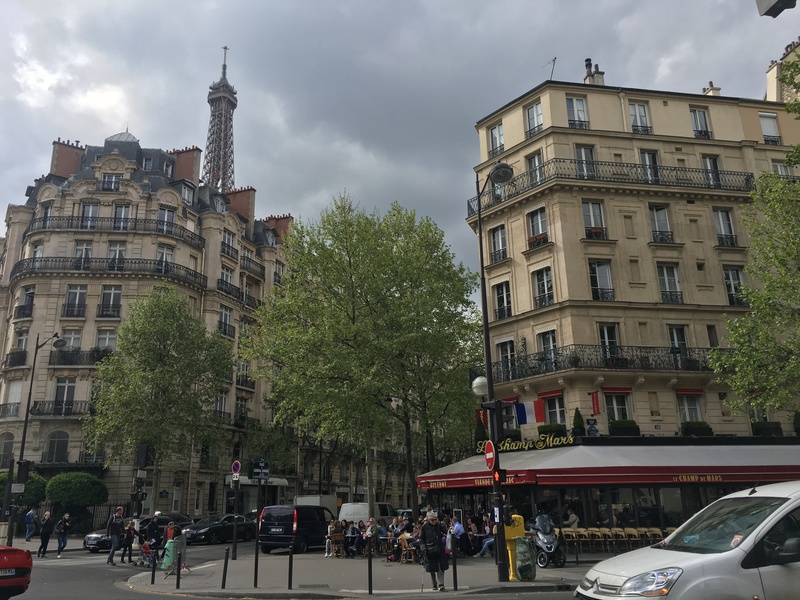 From the moment we stepped out of the metro station, I was smitten with Paris. The rooftops, the church bells, the cafes. If you told me I was forced to sit outside of that metro station for the next ten days and not move, I would have done so and been perfectly content. Alas, we didn’t sit still outside of a metro station for ten days. We moved. A lot. By foot (racking up an average of 10 miles a day), by train (thanks TGV) and even by car (check driving around the Arc de Triomphe off the bucket list). 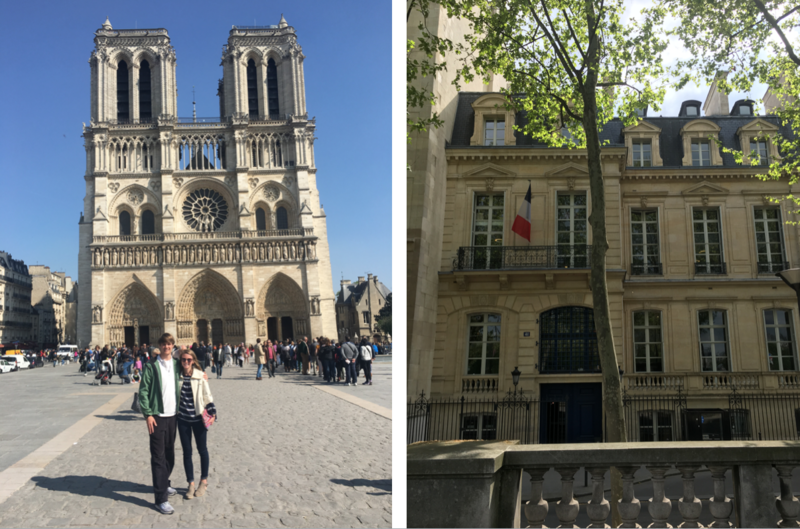 I’m focusing this post on the bulk of our trip, Paris. Stay tuned for details of our other adventures. A friend who lives in Paris recommended we aim for one of the first five arrondissements. Think of Paris’s neighborhoods like a snail, they start in the middle and the numbers get bigger as the wind their way out. One through five are going to put you closest to the action, though I read great things about others and we certainly made our way around while exploring. We opted for a hotel on our first night as we knew checking in early might be tricky with an Airbnb. I read good things about city lockers, but we opted not to deal with it. We landed on a boutique hotel in Saint Germain and LOVED it. While the rooms were small, I couldn’t recommend this place enough. I also had my heart set on at least one room with a cute Parisian balcony and this place fit the bill. 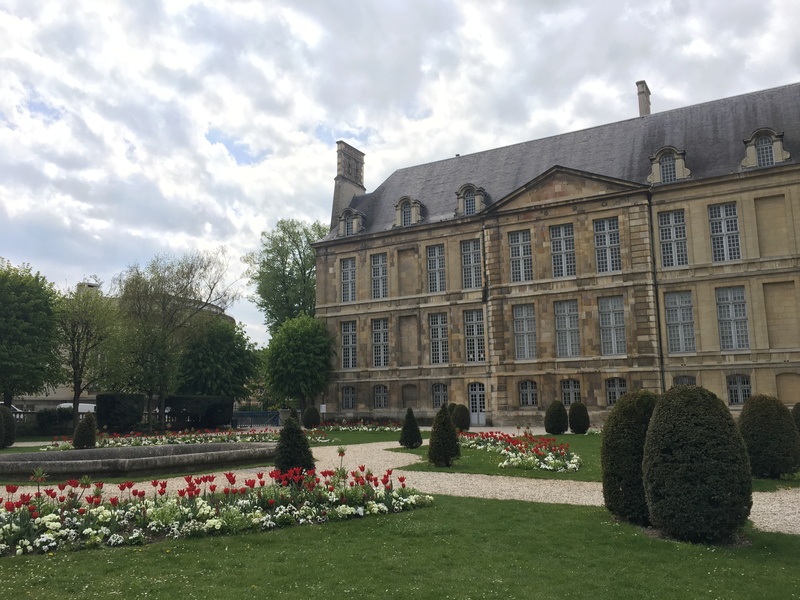 Options in Reims were limited and if I were to do it again, I might even choose to stay in Epernay (town on the other side of La Route du Champagne). We opted for the Hotel Mecure. It was inexpensive, comfortable and we literally only slept there. Back in Paris, we rented an Airbnb in Le Marais. 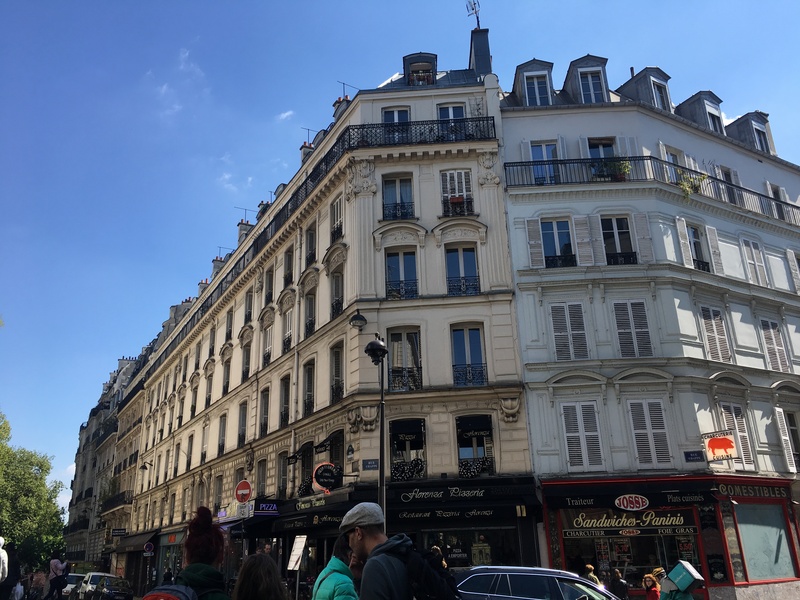 I asked our friend Christian, resident Parisian, to help with this decision as we wanted to find a place close to a metro, in a lively neighborhood, but on a quiet street that would put us closer to locals. This place fit all three and owner Florian was incredibly helpful throughout the booking process. Disclosure: we are not foodies. That might be a crime when heading to Paris, but we’re just not into fancy or expensive when it comes to what we eat. 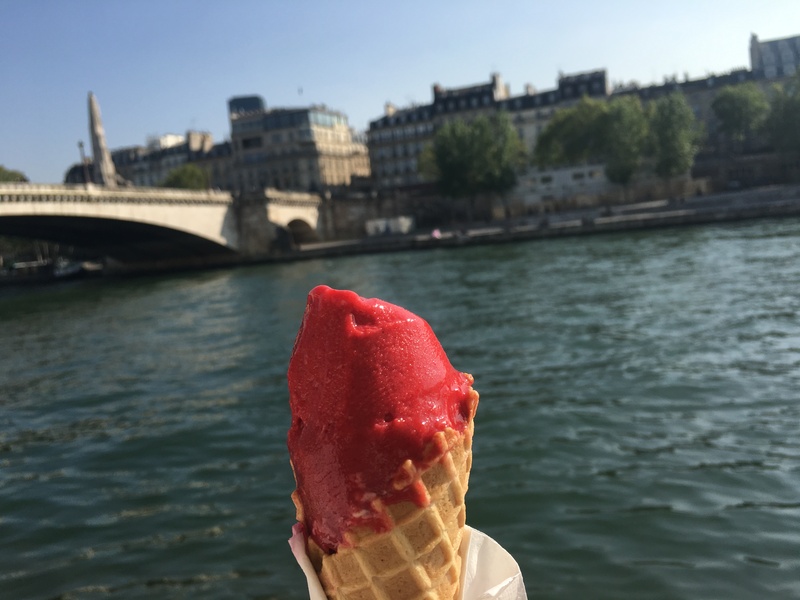 While Paris prices were certainly steeper than we were used to, we were still able to find delicious food for affordable prices. We averaged €5-10 for breakfasts, €15-30 for lunches and €40-60 for dinners. Paris isn’t cheap folks. The most delicious sorbet. There are a few locations that sell their product, but the original is on Rue Saint-Louis en I’lle. There will be a line for take away, it moves fast. You can choose to get a table indoors instead. Tiny little Italian on the northern side of Le Marais. The streets were quiet, the pizzas and salads delicious. A tourist destination. There are several Falafel places on this street, but this one is the most famous. They mention Lenny Kravitz on their sign for goodness sake, but they earned the remarks in my book. We avoided the line here and snagged a table inside. The fries. SO. GOOD. I stumbled upon this sandwich shop on Yelp and we stopped in on our way up to Montmarte. I can’t remember the last time I had a chicken sandwich this delicious. My only regret is not spending more time in this neighborhood, on this street in particular. It was filled with what looked like plenty of delicious South American and Japanese restaurants. 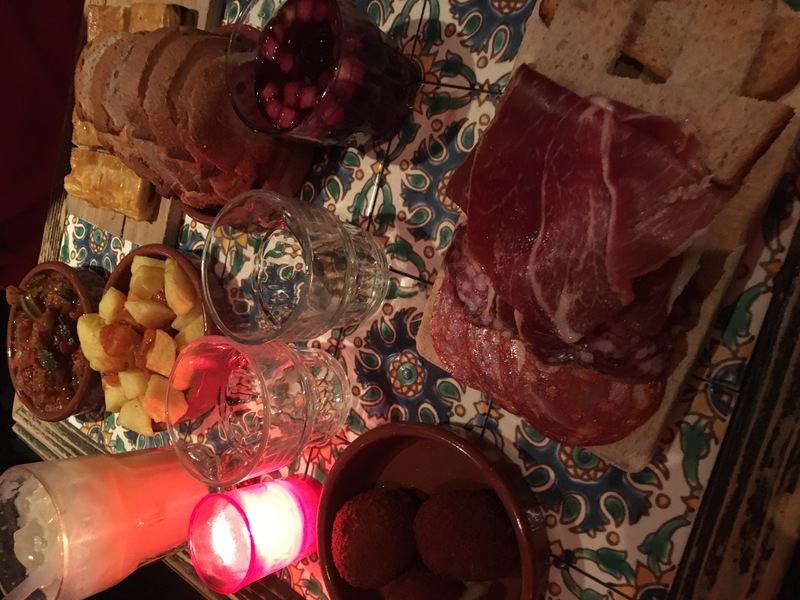 A Spanish tapas restaurant that came highly recommended from a friend. P remarked that this was the dining experience he expected to have in Europe. Loud, lively, fun. The tapas and sangria did not disappoint, the free shots that came along with closing out our bill were a welcome surprise. Side note: free shots happened more than once on this trip. Once after lunch. We declined. Maybe this is a thing in France? Maybe we looked like stressed Americans? Someone chime in. 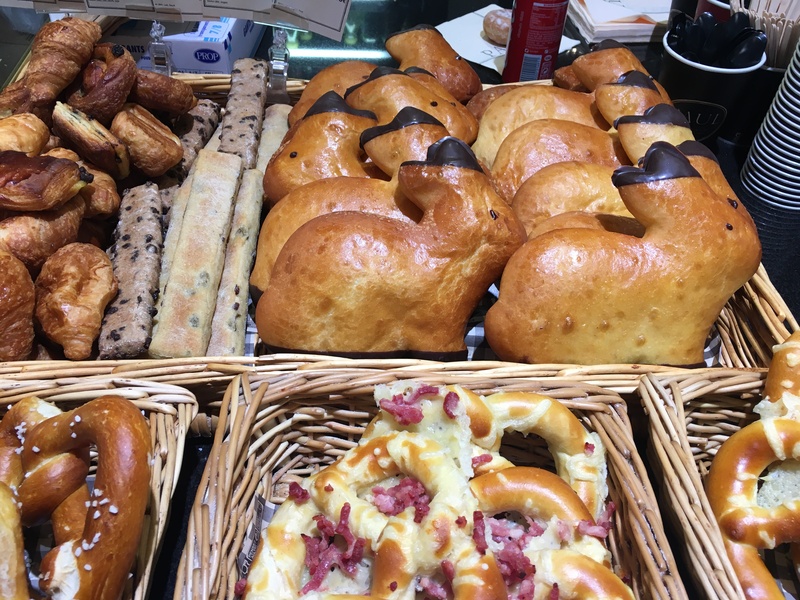 I read and saved about 10,000 bakeries in Paris. We went to none of them. I simply couldn’t resist just walking in to nearly every single one we passed on our way to get to something on my list. They’re on every street. They’re all delicious. Don’t let anyone tell you any different. First up: a lot of wandering. Second: a lot of stops at bakeries (see comment above). Here were some of the other highlights of activities we paid for. Worth it. Splurge for the online ticket. The site is in French, but Google Translate, duh. The ticket will save you three hours of waiting and comes with an audio tour. We purchased tickets one day in advance and looked up a print and copy shop in our neighborhood to print them. I geeked out over this place far more than I probably should have and the history to go along with it is just fascinating. 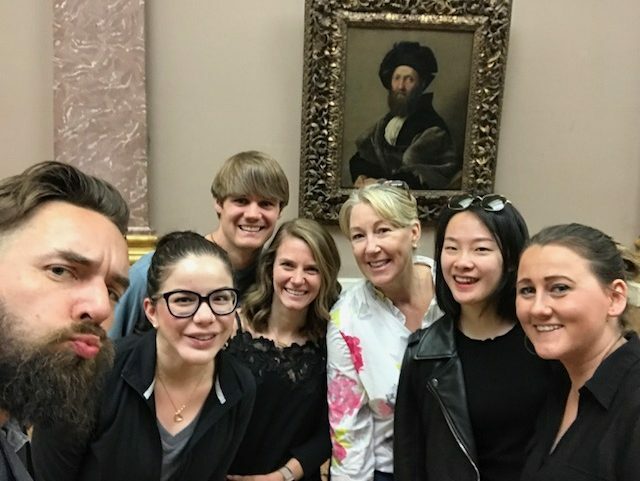 Just like we aren’t food people, we aren’t art people, but when you’re in Paris, the Louvre feels like a must. Thanks to Airbnb’s new experiences, we were able to check it out, learn a little and have an amazing time. If you’re going to Paris, make booking Cedric’s tour the first thing you do. He’s a classically trained art guy (I’m sure there’s a technical term for that) who is also a standup comedian. 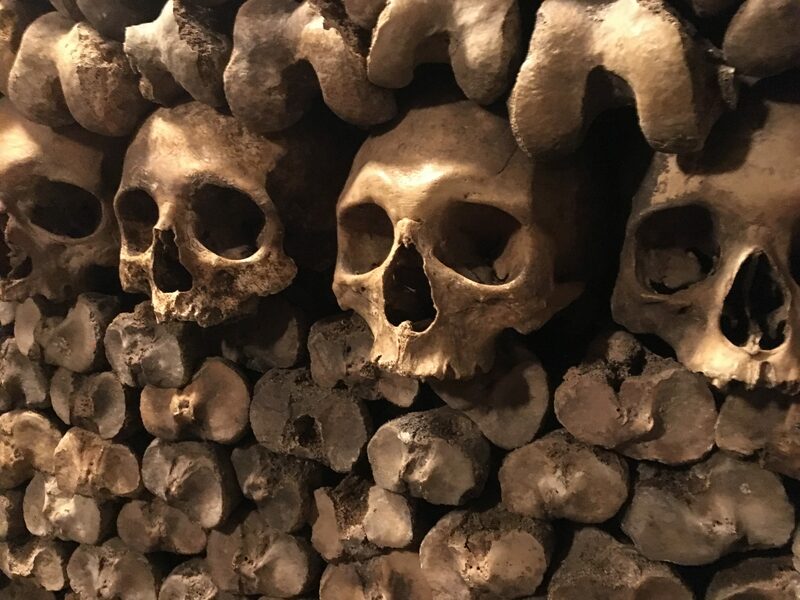 Hands down best tour we did in Paris. While the tour is free, they suggest you tip. And of course you should! 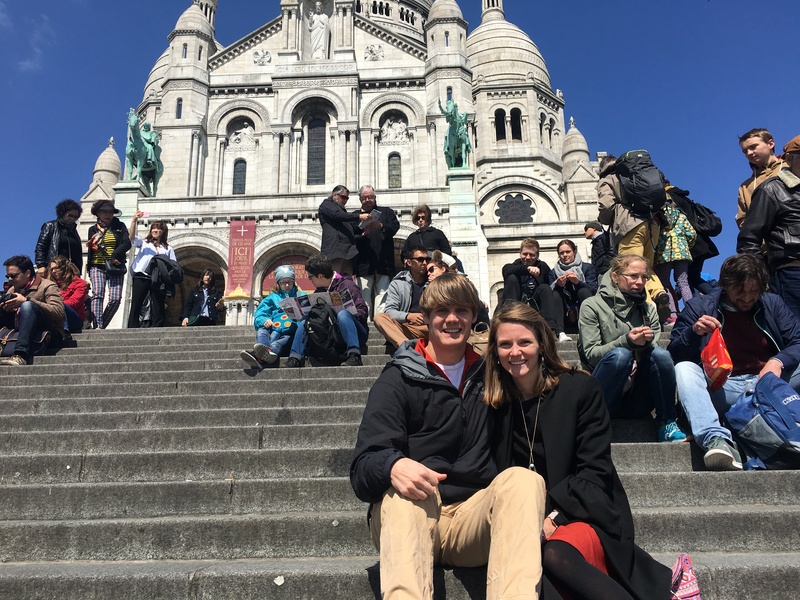 We took the Notre Dame tour and really enjoyed it. Understanding the symbolism of the architecture and the neighborhood was a joy and Eric was a great guide. They do tours all over the city and are a great introduction to the neighborhoods. Bonus if you’re interested in going inside of Notre Dame: the line looks long. It’s not long. Even if it’s to the end of the square, you’re in the church in about ten minutes. We waited about three. This barely belongs in a paid category. We spent a whopping €5 on this. There are Vielb bike stations all over the city, we just happened to pick one along the Seine to stay away from street traffic a rush hour. 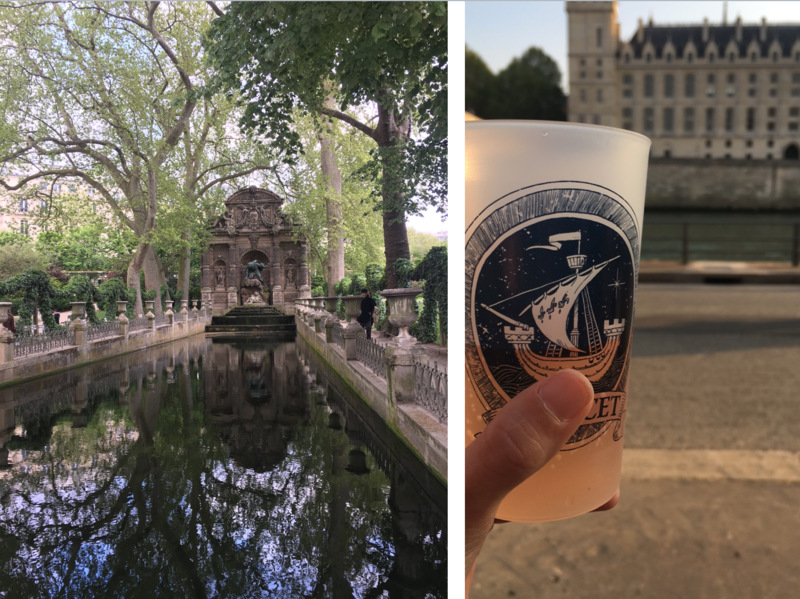 We biked until we stumbled upon the Seine pop-up bars where we checked in our bikes for happy hour. Best afternoon of the entire trip. We came here on more than one occasion. If it wasn’t freezing most of our trip (by southern standards) I would have loved to linger longer. I was especially enamored by the tiny house that the ducks live inside of on the pond. All ducks should have their own houses. Way to go, France. You’ll know this one as where Jim Morrison is buried. Do check that out, but then check out some more. 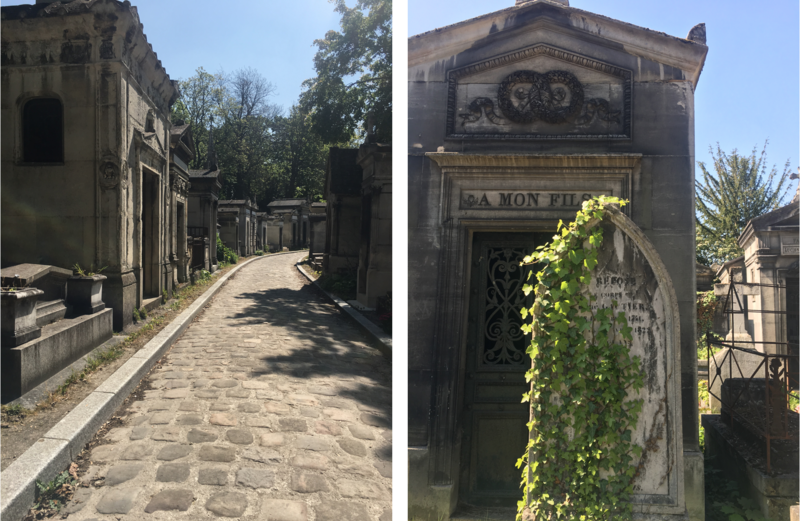 The mausoleums are stunning and the trees throughout are breathtaking. They carry maps at the gate if you’re interested in finding more famous people inside. This gets pretty touristy, but luckily it wasn’t too packed on the day we visited. Plus the views of the city are pretty incredible. – Galeries Lafayette: rooftop bar hidden with the mall. – Minzon: I’m still upset we weren’t able to try the famous cauliflower. – Sewer Tour: this sounds strange, but we heard it’s really fun. Closed Thursday and Friday. – Saint Chapelle: I was over lines and tourists. So many lines. – Merci: described to me as Anthropologie in France. Probably a good thing we didn’t make it. 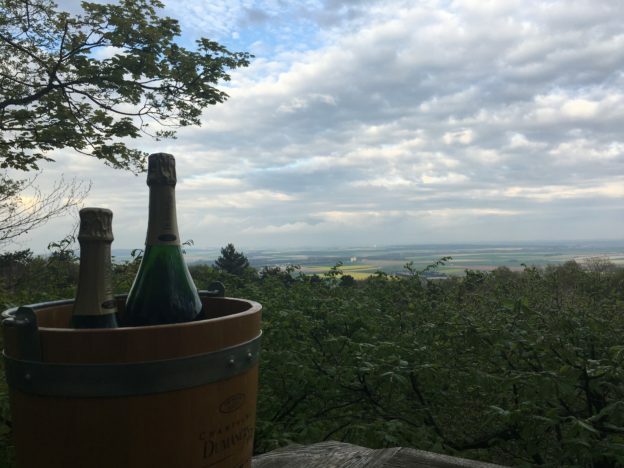 Next up: more on this adventure, including champagne and World War II history. Stay tuned. 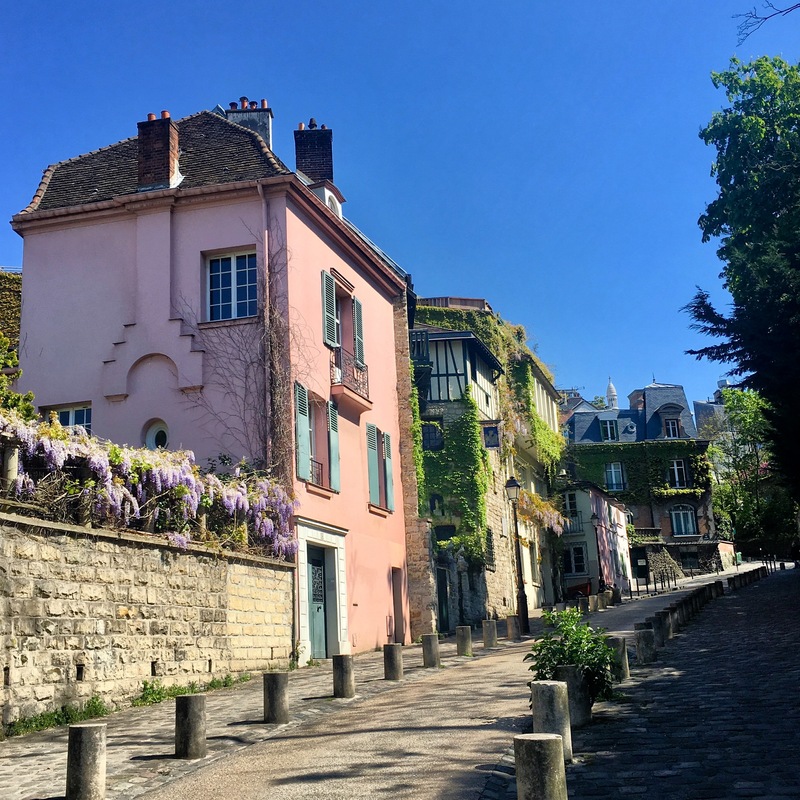 This entry was posted in Everyday Adventures and tagged deals, europe, france, paris, travel, vacation on May 11, 2017 by Kaitlyn White. 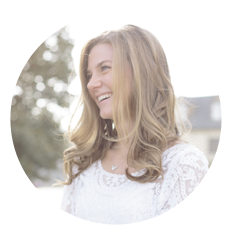 I'm Kaitlyn, a twenty-something busy exploring, creating and figuring out life one little adventure at a time.